The secondary market bond yields were seen increasing during the shortened trading week ending 8 February on the back of profit-taking along with selling interest amidst a slowdown in foreign buying interest towards the latter part of the week. Yields increased across the curve with the liquid maturities of the two 2021s (01.08.21 & 15.12.21), 15.12.23, 01.08.26, the two 2027s (15.01.27 & 15.06.27) and 01.09.28 increasing to weekly highs of 11.02%, 11.00%, 11.03%, 11.20%, 11.30%, 11.37% and 11.36% respectively against its week’s opening lows of 10.80%, 10.88%, 10.90%, 11.15%, 11.19%, 11.23% and 11.25%. This in turn led to a parallel shift upward of the yield curve on a week-on-week basis. The bearish sentiment was further supported by the outcome of the weekly Treasury bill auction, where the 364 day bill weighted average held steady at 10.69%, following six consecutive weeks of decreases. 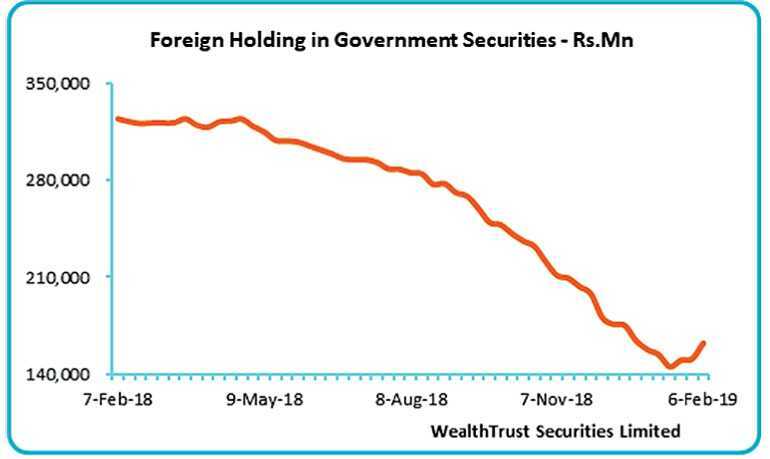 Meanwhile, the foreign holding in rupee bonds continued to increase, recording a 71 week high inflow of Rs. 11.51 billion for the week ending 6 February with its total outstanding increasing to Rs. 162.63 billion. 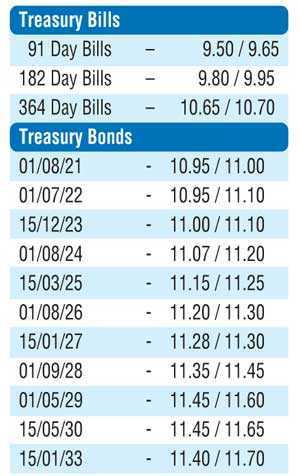 The daily secondary market Treasury bond/bill transacted volume for the first three days of the week averaged Rs. 6.99 billion. 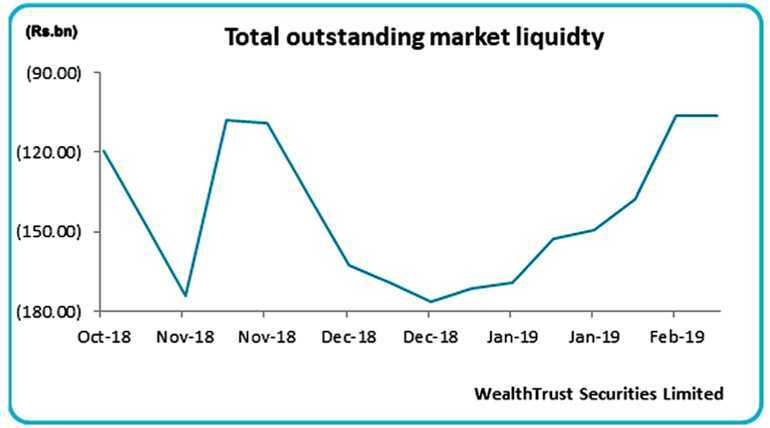 The overnight call money and repo rates averaged at 8.99% and 9.00% respectively for the week as the average overnight net liquidity shortfall in the system reduced to Rs. 100.06 billion for the week against its previous weeks of Rs. 111.76 billion. The OMO (Open Market Operation) Department of Central Bank continued to inject liquidity by way of reverse repo auctions during the week on an overnight and seven day basis at weighted averages of 8.97% to 9.00% and 9.00% respectively. The demand by importers along with buying interest by banks saw the rupee dip during the week against the dollar to close the week at Rs. 177.70/85 against its previous weeks closing of 176.80/10. 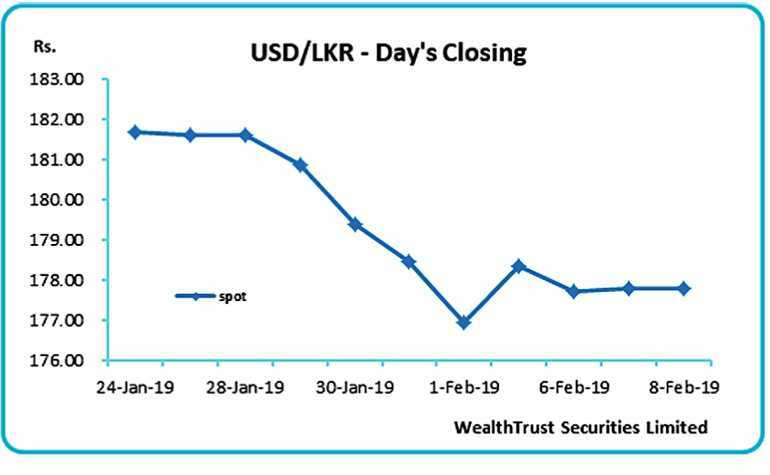 The daily USD/LKR average traded volume for the three days of the week stood at $ 118.92 million. Some of the forward dollar rates that prevailed in the market were one month - 178.55/75; three months - 180.45/75 and six months - 183.30/60.